The edition published by Viz Media is soft cover with a dust jacket. But the cover is actually quick thick and hardy. There are 164 pages to give this book a nice thickness. 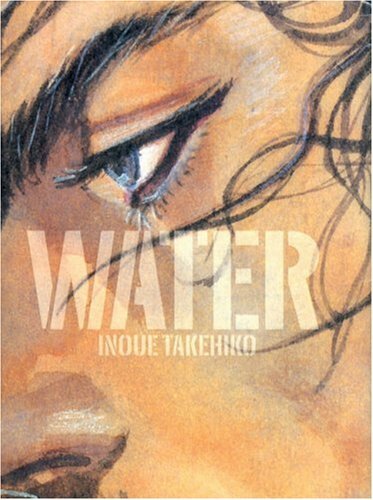 This is the art book by Inoue Takehiko. It's based off the manga Vagabond. If you like the manga and the water colour section that starts each comic, this book is definitely for you. It contains many water coloured full page illustrations, some of which comes from panels and covers from the comic book. These water colour paintings, when blown up to full page, show an incredible amount of detail. I'm talking about details like the kind of texture created when water colour touches paper and the gradation. The colour reproduction on the book is perfect. Every page is a delight. This book has no captions. It doesn't need them. Fans of Inoue Takehiko or his comic should find this book very satisfying. There are two art books released based on the Vagabond comic. This is one of them. The other is called Sumi: Vagabond Illustration Collection which contains black and white line art illustrations. Check out the my review for Sumi too. Here's Amazon Japan shipping rates for your reference. I'm really impressed with people who are gifted with unquestionable talent. I know how to paint, draw, write, etc., but not as excellent as this! Amazing.